High Five Events is thrilled to announce that FloSports will provide live-streaming coverage of the 2017 Austin Marathon® presented by NXP. The live feed will provide coverage for the entire race and be seen by fans across the globe on FloTrack.com, the leader in live-streaming video and digital content in running and track & field. 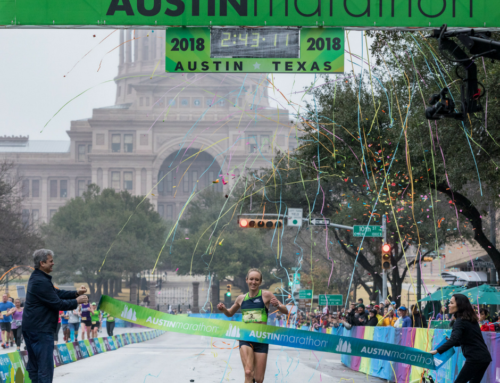 FloSports, a sports media company in Austin, Texas, will highlight the Austin Marathon’s Elite Athlete Program by following the men’s and women’s elite leaders throughout the race. They will also have a camera capturing finishers as they cross the finish line. In addition to being available online, the feed will be displayed on the finish line Jumbotron. About FloSports: FloSports is a direct-to-consumer, subscription-based sports media company based in Austin, Texas, that partners with event rights holders and governing bodies to unlock a world of sports coverage that true fans have been waiting for. Through live streaming of premier events, original video programming, and weekly studio shows, FloSports is growing the sports, the athletes and the fans. Current verticals under the FloSports header are Wrestling, Grappling, MMA, Elite Fitness, Boxing, Softball, Gymnastics, Marching, Basketball, Volleyball, eSports, Cheerleading, and Track.